Infrared Heaters operate on natural gas or propane. True Dual 2-Stage Heaters regulate air and gas flows at high- and low-heat stages for optimum efficiency. Design certified to ANSI/CGA standards and approved for indoor/outdoor use, they have high heat/low heat input ratings from 85,000/65,000 BTUH to 200,000/145,000 BTUH. Other features include direct spark ignition and heavy duty 12 ga black steel combustion and heat exchanger tubes. SS models are available for wet, humid, and corrosive environments. Rochester, MI - Solaronics, Inc., reports their patented True Dual 2-Stage Heaters announced at ASHRAE's January Conference in Chicago are now shipping to distributors and representatives in the US and Canada. Overseas shipments to commence in mid October. "Architects and engineers seeking the most energy efficient heating system can now specify the new Solaronics True Dual 2-Stage Heaters for a wide variety of building types," says Tom Lester, vice president of sales and marketing. According to Lester, Solaronics heaters are typically specified for new buildings and retrofits to existing buildings for manufacturing plants, warehouses and distribution centers, aircraft hangars, ice and roller rinks, auto body shops and auto dealerships, loading docks, fire stations and farm/agricultural buildings. Solaronics True Dual 2-Stage Heaters operate on Natural Gas or LP Gas (Propane). But what makes them truly unique, explains Lester, is that both air and gas flows are precisely regulated at both the high- and low-heat stages for optimum efficiency. He adds: "In most buildings, the heaters will be operating on the low-heat setting approximately 90% of the time, producing a comfortable work environment while lowering energy costs up to 75% over other units." Design certified by CSA International to ANSI/CGA standards, Solaronics True Dual 2-Stage Heaters are approved for indoor / outdoor use and have input ratings from 85,000 / 65,000 BTUH (high heat / low heat) to 200,000/145,000 BTUH. Other features include: Direct spark ignition; 100% safety shut-off; Completely assembled and factory tested burner; Heavy duty 12 gauge black steel combustion and heat exchanger tubes with 10 year warranty; Easy chain mounting. Stainless Steel Models are available for car washes and other wet, humid and corrosive environments. For additional information on Solaronics True Dual 2-Stage Heaters, contact Solaronics, Inc., the leader in gas infra-red technology and products for over 40 years: 704 Woodward Avenue, Rochester, MI 48307. Phone: 1-800-223-5335; FAX: 1-248-651-0357; E-Mail: sales@solaronicsusa.com; Web: www.solaronicsusa.com. Gas-Fired IR Heater suits commercial/industrial buildings. Heater stops cold air penetration at open bay doors. Infrared Heater suits recreational and commercial buildings. 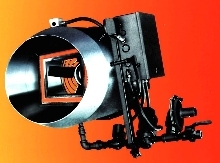 Heaters mount vertically, horizontally, or on angle.